In this Aug. 22, 1998, file photo, Jalaluddin Haqqani, founder of the militant group the Haqqani network, speaks during an interview in Miram Shah, Pakistan. Taliban say the Afghan Haqqani network founder, Jalaluddin Haqqani, an ex- U.S. ally turned fierce enemy, has died. The founder of Afghanistan's much-feared Haqqani network, a former U.S. ally turned fierce enemy, has died after years of ill health, a Taliban spokesman said Tuesday. Jalaluddin Haqqani was 72. Haqqani died Monday inside Afghanistan, Zabihullah Mujahed told The Associated Press in a telephone interview. The elderly founder of the outlawed Afghanistan-based organization, once hailed as a freedom fighter by U.S. President Ronald Reagan, had been paralyzed for the past 10 years. In announcing his death Tuesday, Mujahed called Haqqani a religious scholar and exemplary warrior. Because of his infirmity, Haqqani's network has been led by his son Sirajuddin Haqqani, who is also deputy head of the Taliban. Considered the most formidable of the Taliban's fighting forces, the Haqqani network has been linked to some of the more audacious attacks in Afghanistan. 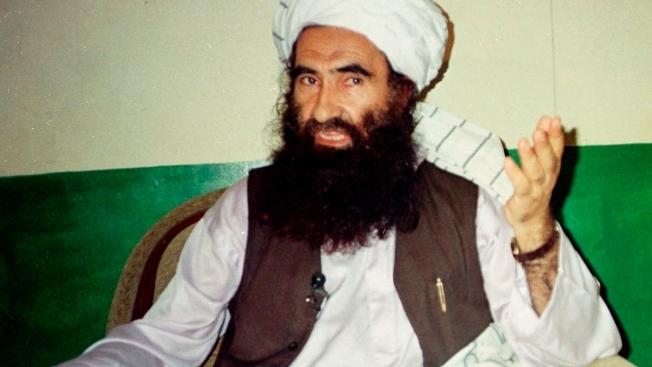 The elder Haqqani joined the Taliban when they overran Kabul in September 1996, expelling feuding mujahedeen groups, whose battles left the capital in ruins. Since then, the network has been among the fiercest foes fighting U.S. and NATO troops in Afghanistan. Haqqani was among the Afghan mujahedeen, or holy warriors, the United States backed in the 1980s to fight the former Soviet Union's invading army, sent to Afghanistan in 1979 to prop up the pro-Moscow government. Haqqani was praised by the late U.S. Congressman Charlie Wilson as "goodness personified." After 10 years, Moscow negotiated an exit from Afghanistan in an agreement that eventually led to the collapse of Kabul's communist government and a takeover by the mujahedeen. In 2012 the United States declared the Haqqani network a terrorist organization. Haqqani had not been heard from in several years and reports of his death were widespread in 2015. Declassified U.S. cables called Haqqani a "moderate socialist" who did not embrace the Taliban's strict rules that denied girls education. "Haqqani functions more in the military area, and is not a force in setting Taliban political or social issues," the cables read. Born in 1947 into the powerful Zardran tribe that dominates southeastern Afghanistan's Paktia, Paktika and Khost provinces, Haqqani was a close friend of Osama bin Laden, who often took refuge in his camps outside Khost. The father of 12 sons, the ailing Haqqani — who had been suffering from Parkinson disease for several years prior to his death — had turned the day-to-day military campaign over to his son Sirajuddin. The elder Haqqani's association with Pakistan dates back to his early years, when he studied a deeply conservative form of Islam at the Darulaman Haqqania madrassa, or religious school, in northwest Pakistan. In an earlier interview with The Associated Press, the school's top cleric Maulana Sami-ul-Haq, recalled a studious Haqqani. It was Haqqani's rigid interpretation of Islam that launched him on the road to insurgency in the early 1970s when he returned to Afghanistan to open a madrassa, or religious school, and organized a movement against Afghanistan's monarch, King Zahir Shah, according to unclassified U.S. documents that tracked Haqqani's militant career from the early 1970s to his partnership with the Taliban in 1996. Forced to leave Afghanistan because of his agitation against the monarchy, which was eventually overthrown, Haqqani set up a madrassa in Miran Shah, in Pakistan's North Waziristan. During the 1980s, when Washington backed an uprising against the communist government in Kabul and its Russian allies, it was Haqqani's military prowess that brought him attention from both the United States and Pakistan. He received both money and weapons from the U.S. While the Soviet Union poured men and money into Afghanistan to support the Communist government in Kabul, Pakistan, the United States and several Arab states including Saudi Arabia and Egypt, stockpiled weapons for the mujahedeen in neighboring Pakistan. Suitcases full of cash were delivered to the mujahedeen through Pakistan, according to a former CIA chief, who spoke on condition of anonymity. He told The AP he personally delivered suitcases full of money to Haqqani, whom he described as "one of the good ones." It was during the 1980s that fighters from the Muslim world were recruited to fight the invading communists in Afghanistan. Bin Laden was among the first to sign up. Many of the Arab fighters gravitated toward Haqqani because he was an Arabic speaker and a ferocious warrior. Many of the Arab fighters, who remain in Afghanistan, including the new head of al-Qaida Ayman al Zawahri, are believed to be protected by the Haqqani network, which it is believed they also help fund. Haqqani developed close ties with Pakistan's intelligence service known by the acronym ISI as well as Pakistani militant groups, many of whom were being groomed by the ISI to fight neighbor India in the disputed Kashmir region. After the Russians left and Afghanistan's communist government fell to the U.S.-backed mujahedeen, Haqqani served briefly as justice minister. He soon abandoned the mujahedeen government frustrated by their relentless feuding and returned to Khost where he maintained close contact with militants, including bin Laden, from Arabic speaking countries. After taking power in September 1996, the Taliban embraced Haqqani for his military skills, according to a declassified 1998 cable from the U.S. Embassy. That cable also said Haqqani "is close buddies with many Arab and Pakistani Islamists." In August 1998, U.S. cruise missiles targeted Haqqani's base in a failed attempt to kill bin Laden. Several Pakistani militants affiliated with the Harakat-ul-Mujahedeen group were killed in that attack. In November 2001, when the Taliban were routed from Kabul, Haqqani was ordered by Mullah Omar to move the Arab fighters to safety. Haqqani had proven to be among the most resilient of Afghanistan's insurgents. Associated Press writers Amir Shah and Riaz Khan contributed to this report.